Should Qantas' Project Sunrise business class seats have doors? 100,000 bonus Qantas Points and $200 back to your new card. Minimum spend. T&Cs apply. Click here. TALKING POINT | All of a sudden, doors are the thing for business class. Four airlines already have them – most recently, British Airways with its new Club Suites – and little doubt that other airlines will tap this trend in the years to come. Which brings us to Qantas’ next-generation business class seats, which will take wing on the Project Sunrise jets from 2022 as they soar non-stop from Sydney and Melbourne to London and New York, with other routes also on the map. Before this year is out, Qantas will announce if the prestigious Project Sunrise contract will land in the lap of Airbus (for the A350-1000) or Boeing (for the 777X), and the clock will start ticking towards delivery of that first globe-striding jet. Part of that process is the design of the new seats which Qantas has promised from tip to tail – a process which Qantas has already begun, in order to meet the necessary lead times, with Alan Joyce earlier this year promising that "we’re looking at redefining business class, first class, premium economy and economy." Which raises the question: should those business class seats actually be suites with doors? Business travellers I speak with seem broadly split on the idea of doors, even in first class cabins. Connected to this seems to be the size of the space: passengers can feel confined in smaller suites once the door is pulled shut. And while doors can help create a quieter and more private environment when it’s time to sleep (which will be a major component of those marathon Project Sunrise flights), they’re a bit of a barrier to attentive crew service during the rest of the flight. However, there’s no denying their popularity among those airlines who have them and the premium passengers who fly them. So this week, we’re asking Australian Business Traveller readers to share their thoughts with Qantas (we know they’re reading!) on Project Sunrise business class: doors or no doors? David Flynn is the editor of Australian Business Traveller and a bit of a travel tragic with a weakness for good coffee, shopping and lychee martinis. In short, yes! If you want privacy, you can close the door. If you want a bit more of an airy feel, just leave them open. It’s all about choice! Choice is the luxury. It’d be like a little lady in the city of lights. Qantas has the mantra that their ‘service’ is the key to their product delivery. This isn’t enough any more. We have 4 business class generations in service to date and they’re already working on #5 with project sunrise. One thing that Qantas doesn’t do, is engage their top tier flyers (who will fly other airlines) for advice nor look at what the competition is doing. For premium flyers on 17+ hour flights, the seat needs to be private and the cabin needs areas to get away from your seat (a bar & lounge). 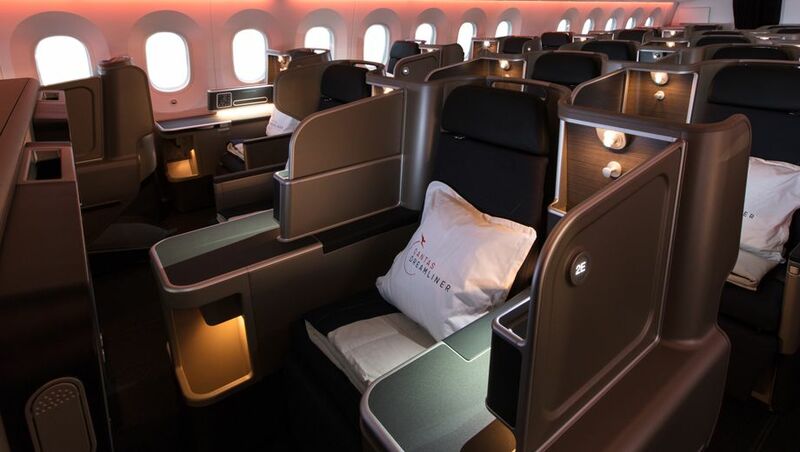 If the Qsuite is winning awards and even the new BA J seat is getting doors, no doubt Qantas will implement something from a few generations ago and bang on that their service will make 17 hours in the sky relaxing and comfortable! I was involved in Qantas focus groups for Project Sunrise ... along with others. I thought their process of engagement with their premium customers was excellent. Its a shame you didn’t have the chance to be involved, it seems like you would have appreciated the opportunity. "we’re looking at redefining business class, first class, premium economy and economy." I’ve heard repeatedly Qantas wanted doors on their new First cabin refit on the 380 and move it- but CASA won’t certify it. Australian abaiation authorites are known to be conservative and were the last (if they have yet) to approve global standards. I’d say if true makes sense why the 789 doesn’t have doors either. David - perhaps CASA could comment on this? They won’t even certify the current 787 seat to be in the semi reclined mode despite the same functionality on the 330. Out of interest how does CASA so no doors to Qantas, but other carriers can fly into Australia with doors a plenty without a problem. Surely doors are either a problem or they’re not, but not both? The aircraft are not registered in Australia and thus CASA has no jurisdiction. Doors are great if they are designed not to take up extra space. My priority list for these flights would be in the following order. Also some form economy+ should be the minimum seat type with better seat pitch, width and upgraded food. This has to be more than just a flight, it has to be an great experience for all. Leisure passengers would just go on a longer route if it was just about cost. Easy for me to say though, as arm chair CEO. Seat width is an issue. I find it very hard to comfortably sleep on the existing J class seat without lowering the armrest. If a door arrangement means this is no longer possible then I'd probably vote no though the extra fuselage width of the 777 or A350 should mean the actual seat base can be wider than the existing 787/A330 seats. I think the key for Qantas is not just to catch up to those already providing the option of a door, but to leap frog them and really raise the bar for others to play catch up in the years to come. That's up to the people who have much more creativity and engineering skills than I'll ever have. A good start is listening to your customer, especially those who use the product frequently. Don’t disagree, but saying “do better” without any ideas for what better could look like isn’t really all that useful for the listener. Given the huge amount of positive feedback and praise for any business class with doors, "Should Qantas' Project Sunrise business class seats have doors?" seems like a rhetorical question. I can only recall a handful of people who have said that they don't like the door closed. No door, make the seat wider. I miss the 30" SQ J seats. Absolutely! one of the only complaints I have with VA's "The Business" offering...needs a privacy door. I would prefer extra attention to insulation from passengers in surrounding suites, who turn on overhead or reading lamps right in the middle of sleeping time. No from me. Part of the appeal of choosing Qantas is to have that engagement with an FA from home. Is there not a safety aspect to this as well? In an emergency evac would these boxed suites become a hindrance to a quicker and safer exit? I'd also like satellite television (cnn, bbc world, cnbc, sport 24, and possibly Abc Australia ) on board all the sunrise aircraft as I like to keep abreast of things that are happening on the ground. I recently travelled on the cx a35k and this was a nice feature. And how long will it be until we want a flat bed in premium economy. Business class today is what first class was 10 + years ago. Nothing wrong with that, just makes first class obsolete. They should add a shower for first class like Emirates does on the A380. They need to do something to make First Class stand out more. Showers = extra water = extra weight. Not something they would be keen on when trying to make these non-stop flights. How much extra weight will doors add? It’s hoses for courses and corrals for cattle. Yes please. I don’t socialise on flights, and do 95% of my travelling alone. I have travelled on airlines with doors on suites and have never used them. I just don't understand why they are necessary. Unless they - and the suite walls - extend all the way to the ceiling, then anyone walking past can see you over the top of the walls anyway. So it really makes no difference to "privacy". I much prefer spacious open-plan cabins. I don't want to be stuck in a cubicle. It's also not great from either a service or safety perspective. This is the key. I think I read that the BA door is 130cm-ish high? My pre-teen is taller than that! Doors just seem like wasted weight to me. I’m not sure why they are necessary or why the illusion of privacy is so necessary. Illusion in that the doors barely come up to waist height and can be easily looked over. If doors actually closed of a section of cabin it might be a different matter. It would be great to be able to open the window blind without disturbing one’s neighbours. On something like the project sunrise trip it would be good to regulate the circadian rhythms with natural light. Some business travellers need the doors if they're working on something that requires confidentiality. So as such, the door is useful for them. But honestly I don't see the door as vital for privacy. Generous privacy shields work well enough to provide a highly private experience. Doors are only really necessary if the seats themselves face into the aisle. Reverse herringbone without a door is private enough. Also, QF have weight requirements for Project Sunrise. Doors add weight. They could always take a loo or two out for weight saving? Don't laugh....I bet my bottom dollar that was a valid considered option at the weight saving strategy meeting at QCC!! I’ve got to say some of these replies made me laugh (in a good way) the Rod Liddle phrase is great :) Personally (and ultimately it is a personal decision) I’ve found myself looking the idea of doors more than the reality. I love Q suites. But I rarely, if ever, close the doors. I just don’t feel the need. Others clearly love being able to. For Qantas then, in joining all the other armchair CEO’s, I imagine these are routes that will face very little if any competition on a direct flight basis. My only concern of fitting doors (which can of course be left open) is if they impede on the space available, especially in terms of seat width. As on such long flight comfort is going to be the most important feature. They could have one of those electronically manageable windows made as “doors” that cover the ceiling and sides (and one that can be moved) for privacy. To be honest, the straight seats on the new business suite on QF aircrafts are miles better than SQ and VA (angled seats). More leg/knee room when lying around is a lot more important than a privacy door IMHO. I wonder why they could not do stepped seats/beds, so the “lower level” and “upper level” pax can get good leg and shoulder room. But what would the voyeurs do for 18-19hrs? Seriously, I'm not that important and nor is the work that I do, so doors are not a things for me. I really like the concept of curtains that AF uses in F, I'm not a big fan of the doors. Staggering the seats so you don't see directly across to your neighbor across the aisle would probably fulfill my need for privacy, given people walking past my seat can see over a door anyway. Some way to further deaden noise and carefully positioned lighting that doesn't shine around the cabin would help me relax more versus a door. Comment on "Should Qantas' Project Sunrise business class seats have doors?" Sign up to the free Australian Business Traveller newsletter. Get the latest news for business travellers and frequent flyers every week. No, thanks. I don't like travelling better.